A sustainable European workforce has become increasingly relevant in our present day and age. Flexibility and job insecurity are omnipresent; organizational workforces are displaying growing diversity with respect to age, gender, ethnicity and family status; and Europe’s welfare states are delegating more and more responsibility for the well-being of workers to employers. Now more so than ever, organizations need to consider investing in workers to improve their performance and level of satisfaction. These investments can take many forms, including flexible work arrangements, training plans, child-related policies and health programs. The crucial question is how to make this happen. Why do some organizations invest more and others less in their employees? Why do some employees make use of these investments and while others do not? Why do such investments sometimes improve employee performance and satisfaction and sometimes not? This book addresses precisely these questions. 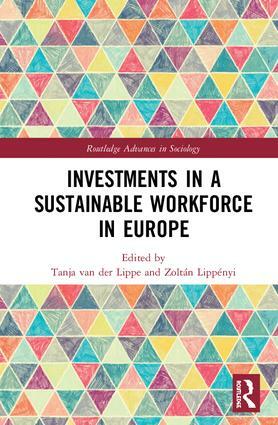 The book contributes a new, large-scale survey of 259 organizations, 869 work units, and 11,011 employees in six diverse economic sectors in the Bulgaria, Finland, Germany, Hungary, the Netherlands, Portugal, Spain, Sweden and UK to study the causes and consequences of organizational investments. This book appeals to undergraduate and postgraduate students, researchers and lecturers in the fields of Sociology, Business and Management, and Organizational Studies. It will also be useful for practitioners of Human Resource Management and others interested in workforce sustainability. Which older workers participate in which personnel policies? HR investments in an employable workforce: Mutual gains or conflicting outcomes? Do female managers improve women’s promotional opportunities? Tanja van der Lippe is professor of Sociology at the Department of Sociology of Utrecht University, head of the Department of Sociology, and chair of the Research School ICS. Her research interests are in the area of work-family linkages in Dutch and other societies, for which she received a number of large scale grants from Dutch and European Science Foundations. She received an ERC Advanced Grant for her research into ‘Investments in a sustainable workforce in Europe’. She is an elected member of the Royal Netherlands Academy of Arts and Sciences (2014), the Royal Holland Society of Sciences and Humanities (2013), and the European Academy of Sociology (2010). Her edited books include Quality of life and work in Europe: Theory, practice and policy (Palgrave, 2011), Competing claims in work and family life (Edward Elgar, 2007), and Women’s employment in a comparative perspective (Aldine de Gruyter, 2001). Zoltán Lippényi is assistant professor in Organizational and Economic Sociology at the University of Groningen, the Netherlands. He is a member of the Interuniversity Center for Social Science Theory and Methodology (ICS) and the ISA RC28 Social stratification and Mobility. He obtained his PhD (2014) in sociology at Utrecht University. Between 2014 and 2018, he worked as post-doctoral researcher within the ERC-financed Sustainable Workforce project, focusing on the consequences of organizational employment practices, and in particular adoption of flexible work and employment arrangements, for workplace inequality and employee outcomes. Since 2015, he represents the Netherlands in the Comparative Organizations and Inequality Network (COIN), a research collaboration studying workplace wage inequality from an international perspective. In this collaboration, he studies the effects of organizational context and change on inequality in wages, using register-based linked-employer employee datasets. His work is published in the European Sociological Review, Research in Social Stratification and Mobility, History of the Family, and Social Science Research.